Our easy-to-tow Mallard M185 is a full featured travel trailer in a smaller, lighter package. You will appreciate the openness of the M185 layout featuring an arched ceiling measuring in at nearly seven feet. The M185 gives you plenty of room to relax, dine and unwind. Oversized windows let in natural light and spectacular views of the great outdoors. The M185 provides a kitchen with efficient wide-open prep area, as well as large base cabinets and huge overhead storage for that extended vacation. All of our Camper rentals include bed linens, pillows, towels, small appliances, kitchenware, utensils, plus much more. We like to say "just bring your toothbrush!" Fully Outfitted For Your Vacation Enjoyment! Our Aerolite travel trailer is perfect for smaller families or couples looking for a ultra-comfortable, spacious retreat after your exhausting, fun-filled day. The Aerolite's opposing slide-out design gives you a very roomy living area with plenty of room to relax and enjoy your stay away from home. Large windows let in lots of natural light and the panoramic rear window provides a great view of the outdoors. Some of our Aerolite's great features are a private bedroom with premium king-size memory foam mattress, full size fold-out sofa sleeper, swivel rockers, spacious kitchen, and large entertainment center. 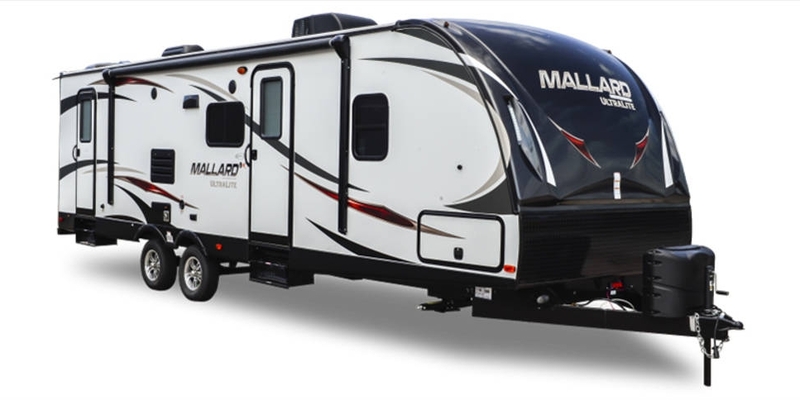 Our Mallard M33 is a full featured travel trailer designed with a wide-open floor plan making it perfect for large families or groups. Residential-style appliances, large kitchen with island, and three slide-outs ensure you will have all the space and comfort to relax and entertain. The arched ceiling measuring nearly seven feet is complimented by oversized windows that let in lots of natural light and provide excellent views of the great outdoors. The M33 also features a large U-shaped dinette, sleeper sofa, two private bedrooms, 4 TV's, bunk beds, plus much more! All of our Camper rentals include bed linens, pillows, towels, small appliances, kitchenware, utensils, plus much more. We like to say "just bring your toothbrush!" Our exciting Cougar 34TSB travel trailer is loaded with extra options that few RVs can match and is totally geared for the large family. Great open living space, large peninsula-style kitchen, Residential-style appliances, and three perfectly located slide-outs are sure to surprise and delight you for a incredible and memorable camping experience. The arched ceiling measuring nearly seven feet is complimented by oversized windows that let in lots of natural light and provide excellent views of the great outdoors. The Cougar 34TSB also features a large dream- dinette, sleeper sofa, two private bedrooms, 3 TV's, bunk beds, plus much more! All of our Camper rentals include bed linens, pillows, towels, small appliances, kitchenware, utensils, plus much more. We like to say "just bring your toothbrush!" The Catalina's great open floor-plan provides a spacious, comfortable living area your family will truly enjoy when it's time to wind-down from the day's fun. The unique split-master bedroom design is great when a little quiet time or privacy is needed. Oversize windows let in lots on natural light and offer great views of the outdoors and a electric Fireplace lets you create the perfect ambiance. With sleep-space for 7 to 8, the Catalina 34Q does not disappoint! All of our Camper rentals include bed linens, pillows, towels, small appliances, kitchenware, utensils, plus much more. We like to say "just bring your toothbrush!" There's nothing better than experiencing Nature and doing it in grace and style! Our Landmark San Antonio Luxury Fifth Wheel sets the benchmark for ulltra-comfortable vacation living. Enjoy the dynamic and spacious living area, large kitchen with floor to ceiling pantry, residential style refrigerator, solid surface countertops, washer/dryer, master suite with wet bar and huge closets plus so much more. When the details matter, the Landmark San Antonio exceeds all expectations! 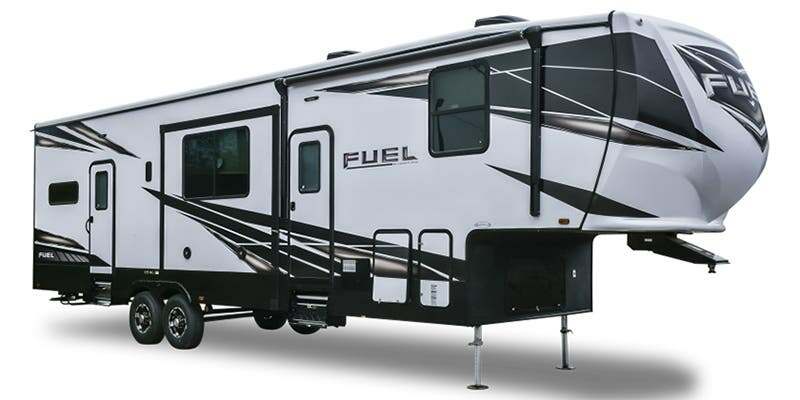 Fun and comfort is what our brand new FUEL 352 Luxury Crossover Fifth Wheel is all about. You’ll appreciate the beautiful cabinetry with dark wood finishes and great interior spaciousness that provide a truly residential look and feel. Huge windows, residential furniture and a full-featured kitchen offer your family the perfect environment for you to truly enjoy the vacation you’ve been waiting for! All of our Camper rentals include bed linens, pillows, towels, small appliances, kitchenware, utensils, plus much more. We like to say "just bring your toothbrush!" Explore the outdoors without sacrificing the comforts of home. 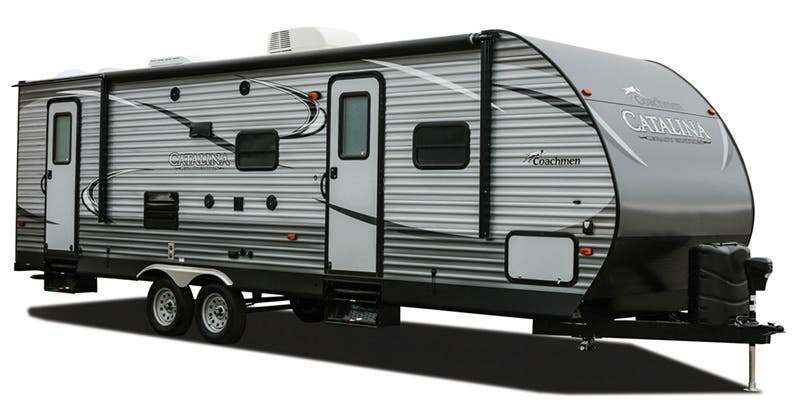 Our COUGAR 369BHS Luxury Fifth Wheel Travel Trailer delivers big on comfort and amenities and is designed with families in mind. Large kitchen with island, residential-style appliances, entertainment center with 50” HD TV and electric fireplace are just some of the outstanding features in this RV. In addition, four large slide-outs create the wide-open living space your family will love. The arched ceiling measuring nearly seven feet is complimented by oversized windows that let in lots of natural light and provide excellent views of the great outdoors. The Cougar 369BHS also features a large dream- dinette, sleeper sofa, two private bedrooms, 3 TV's, bunk beds, plus much more! All of our Camper rentals include bed linens, pillows, towels, small appliances, kitchenware, utensils, plus much more. We like to say "just bring your toothbrush!"